So, driving into the park, Murbachi makes me pull over so he can get a shot of some munchkinland-pretender rocks. I grabbed my camera and we headed off to a small hill about 50 yards away from Park Blvd. Along the grueling hike to the hillock, a purple cactus bloom provided a nice touch of color. It was pretty much the only bloom we'd see throughout the day. Sparse rain to this point has kept the cactus blooms and wildflowers dormant. Low and behold, atop the small knoll, some prospector had sunk a prospect hole. Why did he pick this hill? What made him believe he would possibly find riches inside the bowels of this hill? That kind of sums up what I love about JTree. You never know what you're going to find, or where you're going to find it. The main objective of the morning was to summit a hill I've had my eye on for the past couple of years. A bit of research and some judicious use of Google Earth led me to believe there was something worth seeing atop the steep, craggy and dangerous-looking hill. I had previously walked around the entire behemoth, searching for an easy way up, perhaps an old mining road or even a burro trail. Alas, no such luck. So the climb and exploration sat on the back burners for a couple of years. Until today. Today, the summit would be breached and the prize taken (photographed). Sure, you might be thinking, "Oh, that looks like an easy climb, what's he talking about with this 'steep, craggy, dangerhill' nonsense?" Trust me, every rock on that hill had my name on it and was out for blood. And don't get me started on the Yuccas. After cresting the first summit, we began following the precipitous ridgeline west and came across this shallow prospect hole. Nothing much to see here, so we continued on, swinging a bit north. Down and back up a small saddle, we soon neared the northern end of the mountain. And there it was. This image should provide a great clue as to the location of Mymine. An old shaft which has been filled, or caved-in by the park service. This was pretty cool. The old rails that led from the main shaft of Mymine to the tailing pile were still in place. 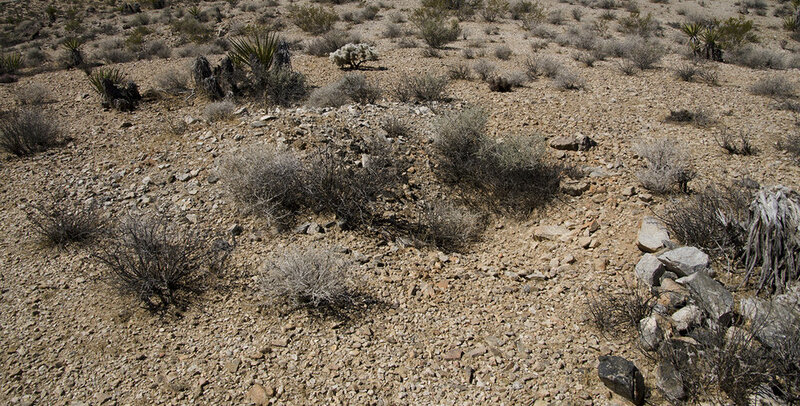 During a mine safing operation in 1967, this spot was visited and several pieces of mining equipment thought to be of historical importance were found, including a mine cart that was still sitting on the tracks. Unfortunately, when Mymine was revisited during a mine survey in 1983, the mining equipment and ore cart were gone. The jumble of wood at the right, with portions of rock walls, are all that remains of a cabin that once stood here. The stone portion of the cabin walls were made of rock, wood and chickenwire. The roof was covered with a layer of dirt and stone several inches thick. It originally was used as a living and storage space. Back during the 1967 visit, it was reported to have been in good shape, with miscellaneous tools and supplies stored inside. Unfortunately, its location so close to the road (think vandals and thieves) and the years of neglect have turned it into the pile of lumber visible today. A metal cover, chained and locked, guards the shaft opening. In earlier years, a wooden trap door also covered the main shaft. Looking down at the cabin ruins. Another view of the caved-in shaft. Was ore from Mymine milled at the nearby Pinto Wye arrastra? To date, no records have been found to say yes or no. I'd been hoping to find one of these for years. Searched countless mine ruins without luck. Today was the day. Off to the west, that wash will lead through a pretty neat little canyon, past several mines and eventually to the Pinto Wye Arrastra, if you make all the right trail decisions. And also to the Pinto Wye Hideout. Retracing our steps, another small prospect hole presented itself for our consideration. 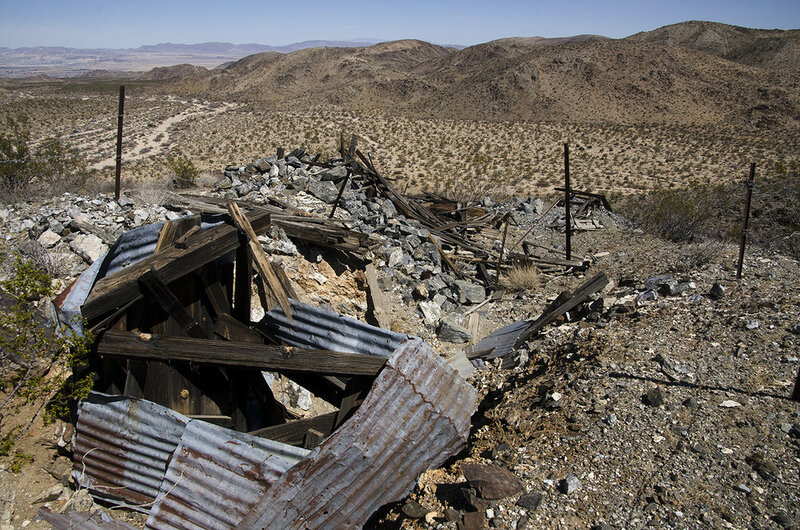 It's kind of sad, but the Mymine location was deemed to be of no historical value in the 1983 mine survey program, and so was left on its own. In another 20-30 years, there probably won't be anything left of this site at all. From atop Mymine Hill, a great look at Park Blvd., heading west towards Live Oak, Jumbo Rocks and beyond. Yes, GreyTac was right where I left it. For some reason, this view of the Pinto Wye intersection really intrigued me. I took a bunch of photos of the Wye and kinda like this one the best. After capturing a lot of pixels, it was time to brave the descent of Mymine Mountain. Ok, maybe it's not really a mountain, maybe it's only a 200-foot-tall hill. I may have exaggerated the danger of the climb just a tad. I was fortunate enough on the descent to capture this photo of the elusive Pinto Wye Monster, locally known as Peggie. By the time we had reached desert level, she was gone. As I've said time and time again, you never know what you're going to find in Joshua Tree National Park.